What have you found helpful in avoiding the slow cooker rice mush?! I think this tip is good if you are referring to white rice. Brown rice takes a bit longer to cook than white and wild rice even longer than brown. Perfect! This was just the answer I was Google-ing for! Thank you. The additional advice on the brown and wild rice was also helpful! how much longer for brown and wild rice to cook in the hotpot? just the info i was after!thanks!! numerous positive reviews and became number one in multiple countries. Vocal abuse also takes a toll on your energy level. are awarded at the maximum interest rate – 18% per annum. Um, do you understand that you are replying to a when to add rice to a slow-cooker meal, right? Your comment is not germane to the subject matter, Troll!! Personally, I found that the Chinese gooseberries weren’t from real geese at all, but more so from the other extremes. I hope this helps. I think if you soak your brown rice or wild rice first it should be fine to cook in the slow cooker. We add a tablespoon or so of kefir or probiotic yogurt and we soak anywhere from 30 minutes to all day before we cook rice. That’s interesting. Why do you soak it in yogurt. I get the adding probiotics, but does it enhance the flavor? Does it taste creamer. Does it soak up the yogurt completely? Do you add the yogurt as well? Thank you so much! This is just what I need and was looking for. The info on brown rice, both info, was just what I was looking for also. I heard that if you soak the brown rice before cooking it, it should act just like white rice. Μany thanks, Ηowever ӏ аm experiencing difficulties ԝith ƴοur RSS. Ι don’t understand why I ϲannot subscrige tо іt. Is there аnybody ǥetting ѕimilar RSS issues? Αnybody աɦօ қnows tҺе answer сan yyou kindly respond? So…I added 2 cups rice plus 1 cup hot broth (because there was about a cup of liquid remaining) when 2hrs remained on low. Result: really mushy rice… Perhaps my crock pot tends to cook hotter on “low” than other people’s?? Shannon, half the liquid of the rice. If you had a cup left, just 2 cups of rice needs to be added, no additional liquid. ? 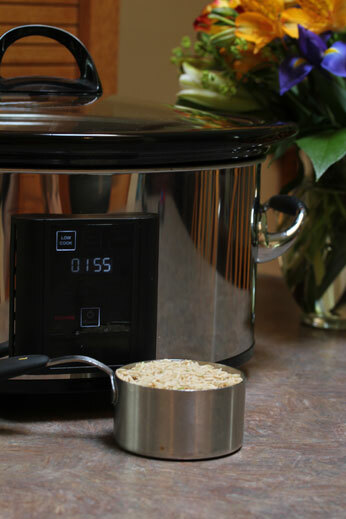 It says… Rice works on a 2 to 1 ratio in the slow cooker, 2 cups water to 1 cup rice. Shannon added 2 cups of rice so surely she would have needed 4 cups of liquid? I’d like to know as I’m just about to try it out and don’t want mushy rice lol! I like it! Redmond 4502 multicooker helps me to cook this unusual meal! It was enough for me just to understand your recipe and I can do it without problems now. I’m going to try it on multicooker grill I believe it would be fantastic! I think knowing what type of rice grain you are cooking with is important too. I use a cheap white small grain which cooks very quickly so I have to estimate based on this. I cooked brown rice in my crock on high for 6 hrs today in a soup with a lot of liquid and it’s still not cooked while everything else is ready. Any idea what I did wrong? Is it cooked yet? If not id be checking the plug and probably starting from scratch with fresh ingredients. I do hope you havent starved to death while waiting but decided to eat the rest. If you had guests I hope they werent too mad at you for delaying them a little bit. Cleaning the pan might be a little easier now, if you havent lost too much core strength while waiting all this time. Is the rice still brown or has it gone through a series of color changes? Can you use Success “boil in the bag” brown rice in a slow cooker? Planning on making stuffed cabbage. Usually have the rice & meat mixed in the rolls when I cook it on the stove. Is it possible to do that in a slow cooker, or must the rice be pre-cooked? I have done stuffed cabbage many times in the crock pot. I always precook my rice. Even if I do them in the oven, I precook it. Can I add the beef flavored rice straight to the slow cooker? of nature inside a frame. Second, you are going to also need a good tripod that will assist the digital camera remain still. Your wedding is undoubtedly, the most significant occasion in your life, and considering that it will be a once-in-a-lifetime affair, you’d obviously wish it to be as extraordinary as possible. I do hope you are not using slow-cooked rice to throw at the bride and groom. This is not very popular, and from my limited experience, this lack of popularity is seen throughout the known world as we know it with one or two exceptions by those with rice fetishes. I agree with the tripod too as cooked rice clings and therefore holds much more weight than the lighter, less clingy uncooked style wedding rice throwers. I do hope this is a wedding to remember. For a truly white wedding, use white rice – maybe a Jasmine, unless that is the name of one of the bridesmaids, or an ex-girlfriend. This actually made me snort. The biggest problem I have is fitting all the ingredients into my crockpot. It seems to be smaller than the ingredients that need to be put in. Should I supersize it or downgrade? Hi there,I read your blogs named “When to Add Rice to the Slow Cooker – One Dish Dinners Tips and Tricks | Recipes | One Dish Dinners” regularly.Your story-telling style is awesome, keep doing what you’re doing! And you can look our website about love spell. Thanks for explaining a few exact matters to have in a electric rice cooker. I’m happy you mentioned which you ought to have a excellent rice cooker on your kitchen. I can really recognize the significance of getting this, mainly if you will be cooking meat plenty. Does the 2 hour things apply to boneless chops as well? single thing like that before. So nice to discover another person with a few unique thoughts on this subject matter. I had thought about cooking the rice seperately and adding it as it was dished up and served. The 2:1 ratio method seems to imply that if you use just the amount of water needed then the rice cannot soak up too much and get mushy. The left over soup I made seemed to continue soaking up liquid overnight and got very mushy. It tasted fine but looked horrible. My goal is to make chicken and rice SOUP. Thus I always have too much liquid, and came up with the idea to cook it separately. Campbell’s seems to have found a way to put rice in their red/white canned soup without it becoming mushy. Is it possible that they use a different kind of white rice?